Today, October 9th, is Hangul Day (한글날), the celebration of the promulgation of the Korean alphabet Hangul 한글 by King Sejong the Great in 1446. King Sejong (세종대왕 in Hangul, 世宗大王 in Chinese characters), the fourth king of the Choson dynasty, was born May 6, 1397 and ascended the throne in 1418 at the age of 21. He died May 18, 1450 aged only 53. He is known for his work improving Korea's defenses against Japanese pirates and invaders from Manchuria, for his patronage of scholarship (among other things, he founded the 집현전 集賢殿 (Jiphyeonjeon) or "Hall of Worthies", a kind of royal academy) and for his own scholarly work. He is credited with the invention of a rain gauge, a water clock, and a sundial. His literary works include the highly regarded Yongbi Eocheon Ga "Songs of Flying Dragons", Worin Cheon-gang Jigok "Songs of the Moon Shining on a Thousand Rivers", and Seokbo Sangjeol "Episodes from the Life of the Buddha". He also compiled the Dongguk Jeong-un "Dictionary of Proper Sino-Korean Pronunciation". Most of all, he is known as the creator and promulgator of Hangul. Prior to 1446, the Korean language was rarely written at all. The written language used in Korea was Classical Chinese. The combination of the use of a foreign language with the large amount of memorization required to learn thousands of Chinese characters meant that only a small elite were literate, overwhelmingly men from aristocratic families. The great majority of people were illiterate. On the relatively rare occasions when Korean was written, it was written using Chinese characters, in part for their sound, in part for their meaning. This too was a complex system poorly suited for mass literacy. Hangul was the first writing system to make it easy for any Korean to read and write his or her native language. I won't give a detailed exposition of Hangul because it would take a good bit of time and space and there are a number of good ones available. The Wikipedia article is quite good and contains additional links. Hangul is an alphabet. Some letters represent consonants, such as ᄀ /g/, ᄂ /n/, ᄃ /d/, and ᄆ /m/. Others represent vowels, such as: ᅡ /a/ ᅦ /e/ ᅵ /i/ ᅩ /o/ ᅮ /u/. They are normally written in squarish groups that vaguely resemble Chinese characters. For example: 기 /gi/, 김 /gim/, 미 /mi/ and 민 /min/. If there is no initial consonant, a special "null consonant" letter is used; in normal writing, the isolated vowels exemplified above are therefore actually written: 아 에 이 오 우. It is for this reason that Hangul is sometimes wrongly considered a syllabary. It isn't, since it is completely analyzable at the segmental level. In fact, the groups into which the letters are formed do not correspond exactly to syllables. The rule since 1931 has been that consonants that belong to the same morpheme must remain within the same block. Thus, "chicken" is underlyingly /dalg/, written 닭. In isolation, the /l/ is not pronounced, but both post-nuclear consonants are written. When the nominative case suffix /i/ is added, the /g/ resyllabifies into its onset and the word is pronounced /dal.gi/, so we might expect to write *달기. In fact, the correct spelling is 닭이. Hangul is considered a great achievement for several reasons. First and foremost, it is a perfect alphabet. It distinguishes all of the distinct sounds in Korean and makes no subphonemic distinctions. From the point of view of the reader, there are no ambiguities. From the point of view of the writer, there are a few ambiguities in that in certain environments syllable-final nasals may be written either as nasals or as the plain stops of the same point of articulation. This is not an error but reflects a decision to write at a higher level of abstraction than a classical phonemic representation. It makes things slightly harder for the writer but makes things easier for the reader, who is given more direct access to lexical representations. Other reasons that Hangul is considered such a great achievement are found in details of its design. Hangul exhibits a significant degree of featural decomposition. That is, components of the letters correspond to phonological features. For example, the aspirated series of stops and affricates are written by adding a horizontal stroke to the letters for the plain series. Thus we have: 가 /ga/ vs. 카 /ka/, 다 /da/ vs. 타 /ta/, 바 /ba/ vs. 파 /pa/, and 자 /ja/ vs. 차 /ca/. The shapes of the letters are based on the configuration of the articulators in making the corresponding sounds. This was truer in the original version of Hangul than it is now. The fairly modest changes over the past few centuries have in some cases slightly obscured this relationship. Hangul is well designed for the reader, in that the letters are easily distinguished, and for the writer, in that the letters are simple. Even I can write legibly in Hangul. 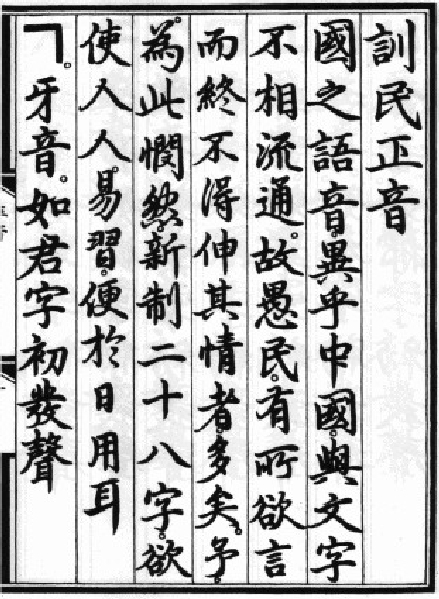 Finally, Hangul is considered a great achievement because the perfection of its design and the care and insight with which it was designed are considered unique and to have had no precedent. Although Hangul certainly represents a very high point in the design of writing systems, it isn't true that its designers had no precedent to work with. They were familiar with Chinese phonological theory and to some degree at least with the writing systems of the Tibetans, the Mongols, the Japanese, and the Jürchen. We know that they were acquainted with alphabetic writing in the form of the Devanagari alphabet in which the Sanskrit of the Buddhist scriptures was written and in the form of the Phags-Pa alphabet. The idea that Hangul sprang from nothing is a bit of an exaggeration. The sounds of our country's language are different from those of China and do not correspond to the sounds of Chinese characters. Therefore, among the stupid people, there have been many who, having something to put into writing, have in the end been unable to express their feelings. I have been distressed by this and have designed twenty-eight new letters, which I wish to have everyone practice at their ease and make convenient for their daily use. Nowadays that isn't such a striking goal, but in his world it was remarkable. In 15th century Korea, as almost everywhere else in the world, literacy was restricted to a small elite - most people were illiterate. Furthermore, Korean society was extremely hierarchical. It consisted of three tiers, nobles, commoners, and slaves. It was almost impossible for a slave to become free, or for a commoner to become a noble. Until 1444, when King Sejong forbade the practice, a slave's owner had the right to kill him at whim. The dominant ideology was Confucianism, a philosophy based on the relationships between ruler and subject, parent and child, older and younger, man and woman, and friend and friend, the first four of which are conceived as inherently unequal. Women could not inherit property. In short, 15th century Korea was a highly stratified society rigidly controlled by a small elite in which those who were not elite and not male had few rights. Indeed, there was strong opposition to the introduction of Hangul on the part of King Sejong's court, so strong that they presented a memorial in opposition and debated with him verbally. The reasons they gave were in part that it was wrong to deviate from the Chinese way of doing things, and in part that such a simple writing system would lead to the loss of aristocratic privilege. Their motives may have been wrong, but they understood the effects of mass literacy all too well. After King Sejong's death, Hangul was very nearly suppressed. It took much longer to come into wide use than he had intended due to the opposition of the aristocracy. For the king himself in such a society to create the means for mass literacy, knowing full well its liberating effect, is absolutely stunning. King Sejong was not merely a great scholar; he was a great humanitarian. Hangul Day is celebrated on October 9th in South Korea and (under the name 조선글날 Choseongeul Day, using a different word for "Korea" in the compound "Korean writing") on January 15th in North Korea. From 1960 until 1991 it was a legal holiday in South Korea. Along with United Nations Day, it was reduced to a "commemorative day" due to pressure from large corporations, which wanted to increase the number of work days and saw Hangul Day as dispensable. If you like to celebrate with a drink, I suggest some 막걸리 makkeolli, a kind of rice wine also known as 농주 nong-ju "farmer's wine". It is triply appropriate. It is particular to Korea, it is the drink of ordinary rural people, and its name is similar to that of the late Jim McCawley, one of the few non-Koreans to celebrate Hangul Day.